The home alarm systems are the electronic devices which help the user to detect the intrusion , the fire , gas leak , panic and more , Most systems are easy to learn and operate , There are strong safety advantages , The alarm systems may be troublesome for the homeowners who don’t take time to arm and disarm them or don’t have the budget to install reliable , costly systems . Home alarm system offers great usefulness in deterring the crime , They are the best way to help protect your home , When potential burglars or intruders see you have an alarm system , They may go elsewhere , They don’t want to risk alarms going off and law enforcement arriving before they can flee the scene . The home alarm system links to a monitoring center that notifies law enforcement of suspected intrusions or robberies , There are two main types of home alarm systems which are wireless and hard-wired , The wireless systems poses disadvantages because it requires batteries and won’t work once the batteries die . The homeowners may forget to check the batteries , Placement is another concern , The wireless alarm systems must be installed close to a central control unit , So , there are limits as to where it effectively can be located . The wireless alarm system may not securely protect all areas of the home , It can be expanded to meet specific safety needs and integrated with the other home systems , so , you can turn it on or off from remote locations . The wired alarm security system is extremely dependable , but it may not look good with the interior design of your property , It is easy to hide the messy wires around ceilings , window and door frames or under the walls , the floor boards or carpets , but it will require you to undertake some significant renovations that may require the services of a professional installer . The wireless alarm security systems are easy to install , They are portable , So , you can take the wireless alarm security system with you if you decide to leave your current home But they are more expensive than wired alarm systems , You may not need to pay for professional installation , So , the cost difference is quite negligible . The cost of the hard-wire alarm systems equipment is lower compared with the wireless alarm systems , After complete installation , They have lower maintenance costs , They are connecting or communicating sensors via cable , They have the wires going to window/door sensor , motion sensor , fire smoke sensor and the other sensors . 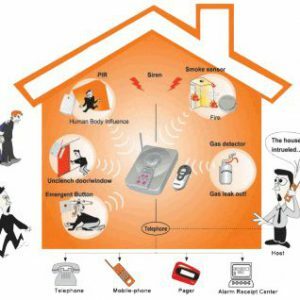 The wireless alarm systems are adopting wireless RF technology via communication between the alarm panels and wireless sensors , All wireless sensors are equipped with RF transmitter and battery , so , wireless alarm systems are more expensive than the hard-wired alarm systems . The wireless sensors are powered by the battery , when these batteries run out , The user have to replace them , this increase the maintenance fee , The hard-wired alarm systems are more secure than the wireless alarm systems . The alarm panel comes with heavy duty metal housing with lock design for hard-wired alarm system , The system with separate keypad design , allow the user to hidden the alarm panel in basement or the other secret place where is not easy to access for strange people or intruder . With this type of design , The hard-wired alarm system still can work , if intruder damage the keypad or cut the cables between the keypad and the alarm panel , Wireless alarm systems are all-in-one system , self-contained with the alarm panel and keypad . When you install the self-contained wireless alarm system in front of the door or in a place where it is easy to access , When the intruder damage it , the whole system will dead and complete off . There is no signal interference , long range transmission distance , If you have a large villa or big warehouse want to secure , you would better to choose the hardwired alarm systems . Most of the wireless alarm system with limitation for the signal transmission between the alarm panel and the wireless sensors , The transmission distance for the hardwired alarm system can reach up to 900ft , You don’t need to worry about the wireless signal strength when you install the hardwired alarm system . The hardwired alarm system has complicated installation , compared to wireless alarm system , They are using the cables between the alarm panel & the sensors , the construction need to pre-wired but it is a big pain , This is a big flaw for hardwired alarm system , So , most people are choosing wireless alarm systems . The hybrid alarm systems provide the best advantages of both hardwired alarm system and wireless alarm system ,They do not only provide highest secure and reliable performance , but also They offer the flexibility for setup and installation . The wireless alarm systems and hardwired alarm systems can use the same methods for the alarm transmission like the telephone line , GSM cellular , VOIP , Internet , VHF…etc .